Multiple Activation Key (MAK) activation occurs directly with Microsoft (different from Key Management Service [KMS], in which activation occurs through a local host server). If your organization has five or fewer computers that need to activate Office 2010, we recommend that you use MAK to activate each computer independently. You can also use the Volume Activation Management Tool (VAMT) (http://go.microsoft.com/fwlink/p/?LinkId=183042) to manage all activated computers. The following are examples of networks that can use MAK independent activation. Fabrikam, Inc. has several remote sales offices around the world. Each office has five or fewer portable computers that are isolated from all possible networks or Internet access. 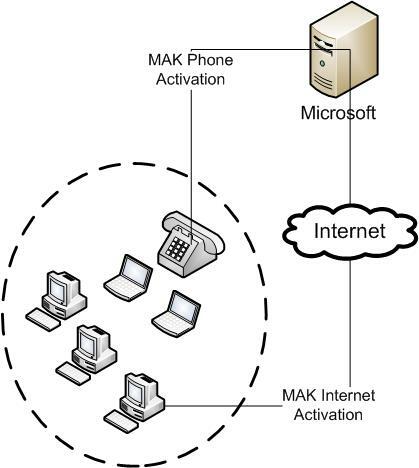 The solution is to use MAK activation for the portable computers individually by telephone to Microsoft. Contoso, Ltd. has three desktop computers that are connected to the Internet and two portable computers that are isolated from the Internet. There are no other networks available. 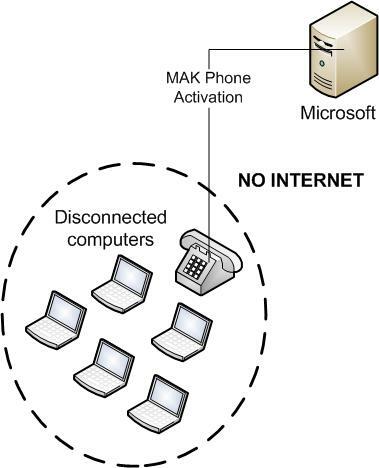 The solution is to manage the MAK activations of the desktop computers through VAMT (http://go.microsoft.com/fwlink/p/?LinkId=183042), and MAK activate the portable computers by telephone to Microsoft. Part of the overall configuration process for Office 2010 is to configure each computer for MAK activation. For more information, see Prepare and configure the Office 2010 client in Deploy volume activation of Office 2010. Follow the relevant procedure to configure Office 2010 by using the Office Customization Tool (OCT), the Config.xml file, or the Microsoft Office Backstage view. If you increase the number of computers to fewer than 50, we recommend that you use MAK proxy activation for all computers that can connect to a MAK proxy server. For more information, see Plan MAK proxy activation of Office 2010. If you increase the number of computers to 50 or more, we recommend that you use KMS activation as the activation method for all computers that can connect to a KMS host server. For more information, see Plan KMS activation of Office 2010. Any other computers can activate with MAK by the methods already mentioned.